Comprising three eight-story buildings totaling just shy of 600,000 square feet, the Arbora Complex near downtown Montreal is one of the largest mass timber projects in the world. The notability of this project is not just its size, but its ability to be a competitive, marketable, environmentally responsible alternative to increasingly affordable steel and concrete construction—an ability we might not associate with mass timber structures. 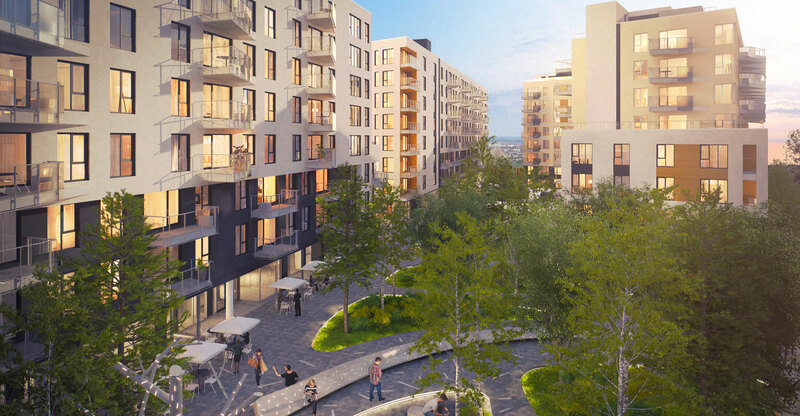 The $130 million project offers 434 units, 130 of which are rental. Arbora involves cross-laminated timber (CLT), composed of layers of dimensional lumber stacked perpendicularly and glued together to create structural panels. CLT panels are typically made of layers of three, five, or seven, and, because they offer two-way span capabilities, can be used for floors, walls, and roofs. The result is a material that is lightweight, strong (up to seven times the strength of concrete), efficiently shipped, and less labor-intensive than its steel and concrete counterparts. 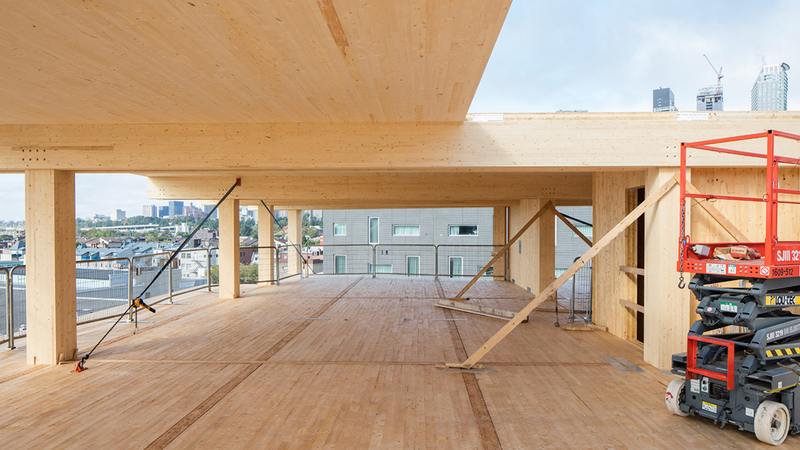 The key to Arbora’s commercial success in a competitive housing market is design efficiency, and an acknowledgement of the inherent structural properties of CLT from the outset of a project. “There are efficiency gains in replication,” Dubois said. The project was organized around a 20-foot grid, an ideal structural span and shipping dimension for the beams and panels. The consistency of the grid allowed an efficient manufacturing process, and abbreviated on-site assembly time. Early adopters of CLT in North America have tended to be more custom projects like schools and sports venues, but Dubois sees demand for mass timber shifting into commercial real estate, namely office workplace typologies, where the unique look of a wood structure can offer differentiation in the marketplace. Mass timber adoption in the United States has lagged behind that in Canadian markets. Dubois attributes this to a number of factors including the litigious nature of the United States, and the tendency of Canadian authorities to be receptive to performance-based design. “In Quebec, we don’t promote one building material over another, so we have to make a market against steel and concrete, which is exceedingly inexpensive,” he said. “We have to be economically viable and prove we are meeting the same structural and safety requirements that other systems must abide by.